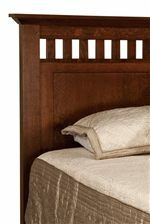 Tapered edges, horizontal slats and soft panel detailing give way to a classic bed of ageless design. With quality construction and rich artistry in one, this bed is sure to be the focal point of any bedroom. Available in twin, full, queen, king, and California king sizes. The Savannah Traditional Queen Panel Bed by Amish Impressions by Fusion Designs at Williams & Kay in the Anchorage, Mat-Su Valley, Eagle River, Alaska area. Product availability may vary. Contact us for the most current availability on this product. 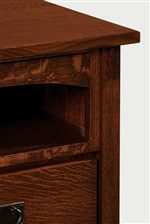 Drawer Suspension All casegoods feature silent, soft-closing drawer glides. Add ball-bearing slides to your table top for a sophisticated look and an exceptionally smooth opening and closing experience. Bed Construction Bed mattress support rails are fitted with a solid cast iron bracket, providing a solid immobile support system. 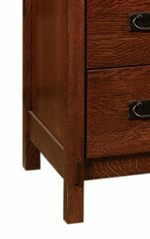 The Savannah collection is a great option if you are looking for Traditional furniture in the Anchorage, Mat-Su Valley, Eagle River, Alaska area. Browse other items in the Savannah collection from Williams & Kay in the Anchorage, Mat-Su Valley, Eagle River, Alaska area.